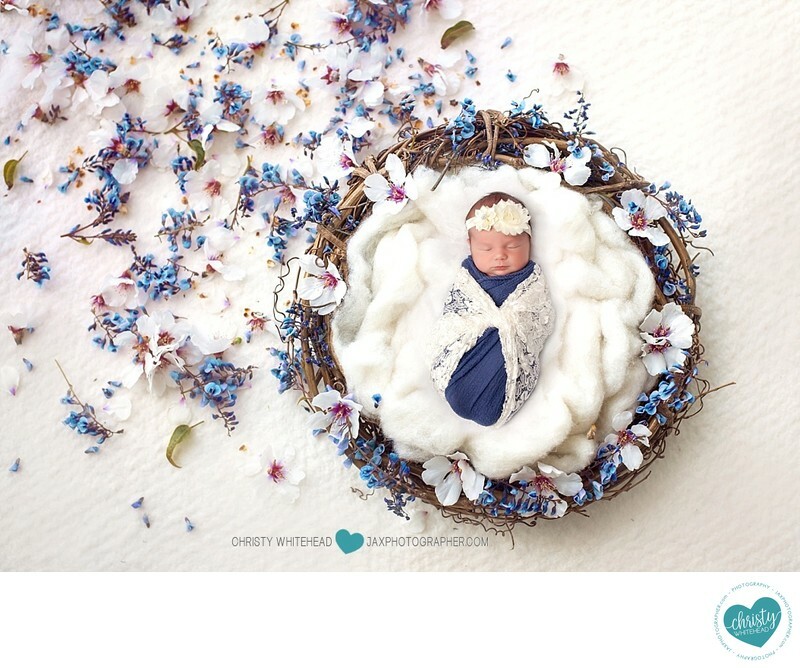 Baby Photography Jacksonville Florida flowers basket - Newborn Photography | Schedule Your Newborn Shoot Today! Time flies by so quickly. It doesn't seem like it was that long ago that I was photographing the wedding of this sweet girls parents at the Keeler Property. One day her parents will be looking back at this photograph thinking these same thoughts as she gets ready to go off to college. Little hands, little feet, little newborn baby yawns formed around tiny little lips. You'll spend days marveling at it all and then before you know it these tiny features give way to toddler features, then big kid features and one day they might even be bigger than you. This is why I love newborn portraits, this moment is so fleeting. It's worth documenting. It's hard to imagine now but one day your child is going to actively avoid snuggling with you. A new toy, a favorite activity or show is going to capture their attention instead. You will miss all the baby snuggles. Babies laying on my chest is one of my FAVORITE things. Is there anything better than a shopping spree for newborn clothes? The ruffles, the buttons, the sassy sayings and sweet animals. I swear the designs get cuter every year. Plus, they are forced to wear the clothing and can't argue back about it!!!! As our children grow and become more independent I sometimes catch myself thinking about the days when they needed me for everything and miss it. So I relish the moments they still need their mom, and while it comes fewer and further between those moments never truly stop. I know, because I'm a daughter myself. Becoming mobile is a complete game changer. Mobility leads to independence and that leads to #4 on the list. Enjoy the snuggles, the quiet moments and the clean house while you can.